We have been catering to some of the biggest IT Giants, on a national and international level. 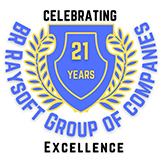 Established in 2002, BR Raysoft Tech Pvt. Ltd is a leading consulting and technology service company in India serving select CMM level 5 companies. Customer-centric approach ensures every client request met in time with desired quality. Company has grown from position of strength to strength. RAY MANAGEMENT CONSULTING Established in 2003, this company carries out the placement of IT professionals to premier IT companies like Covansys,Caterpillar, Satyam, Gavs, Barry Wehmiller International Resources, Financial Objects, etc .It also provides training in management development areas and soft skill etc. BR Computers Ltd, Established in 2001 was pioneer in Raysoft group, with the objective of carrying out the computerization programs and offering consultancy services to computer users. Having implemented basic solutions in the market, the focus shifted to advanced value added solution offerings in networking, storage systems. It also offered maintenance and enhancement services to customers on continued basis, increasing the life of the systems. At BR Raysoft, we are well aware of financial efficiency, which is why we enable enterprises to increase the value of their deliverables with respect to price and performance. We aim to outsource even the smallest of the tasks, and satisfy every requirement to. This is precisely why we are our clients’ most preferred vendor. We offer excellent consultation and hiring services to hone IT skill sets and technologies at all levels. We’ve struck an impeccable balance between rapidly changing technology, available skills, projects necessitate and staff augmentation services. We strive to have a professional outlook, and put our seasoned experience along with awareness of international quality standards to good use. Both our offices (chennai and bangalore) are highly modernised and eco friendly. We have all of the essentials, and a lot more to offer. From power back up, adequate bandwidth, high speed Internet facility to a hassle free environment, we are well equipped to deliver 100%. We have an excellent security system, an well defined disaster recovery plan. Founders are senior people with good experience. #81 VELACHERRY MAIN ROAD GA DAFFODILS APTS,RAJAKILPAKKAM, CHENNAI - 73.